Lisa Jennings has finally made her move threatening to kill Lois Lane unless Superman returns. Determined to save his wife Superman grabs his abandoned costume and confronts his new foe. 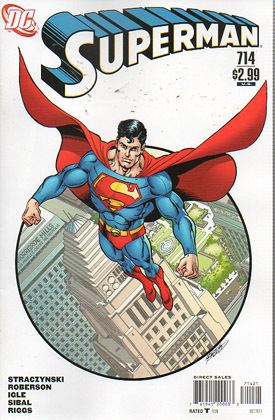 He quickly grabs Lois and drops her off safely in Redmond and the two share a quick exchange but Superman is needed in Seattle and returns for a face off with Jennings. And the Supermen, though remaining hidden, open the door to the Still Zone. Jennings though angry realizes she is trapped and begins revealing what happened to her. It turns out that the crystal presented to her by her inquisitive students was an interrogation device that had landed on Earth when New Krypton exploded. It works by drawing memories from one Kryptonian and linking them to the mind of the Crystal's operator. As Superman walked by her classroom in Ohio it activated and it drowned her mind with all the bad things that had happened to Superman. The connection it seems is two way and Jennings had stalked Superman on his sad walk. Using her new powers she was able to affect his mind and even manipulate everything he saw and heard. When the people were offering support and love he heard them belittling him. Jennings mutations were growing and she began becoming half Kryptonian, powers and all. Superman apologizes for inadvertently creating Jenning's problems but grabbing the crystal he attempts to throw the switch back by flooding Jennings with all the good of Superman. She may know all of Superman's dark secrets and doubts but now she will know everything. Superman gives her his memories of upbringing, his life in Metropolis and his life in and out of the costume... Namely Truth, Justice and the American Way. The crystal explodes knocking Lisa unconscious and the Lightning Door reopens. He calls out to the Supermen and the question that had plagued him for so long - must there be a Superman? The answer is YES! And there always will be a Superman for the people. With Lisa delivered to hospital, Superman returns to Redmond and Lois is happy to see he has snapped out of his depression. She reveals even with his threat she had always been her own woman and had written her story anyway. Clark smiles, despite this getting out of hand one of the things he had always loved about Lois was that she was independent. Superman returns home to Metropolis but not before revisits across America. Armed with seven signal watches he begins The Supermen of America. His first recruits, Super Chief, Steel, Iron Munro, Livewire, Superboy & Supergirl (we'll get to the seventh one). In the Fortress of Solidarity the Supermen watch over the ending of the 'never ending battle'. The Superman Squad was born, and the shards of the interrogation crystal had been scattered all over the world. Each filled with Superman's message of Truth, Justice and the American Way that he had used to heal Lisa Jennings. Those shards created Superman's legacy by imbuing people with his powers and instilling his ideals upon them. Lisa reveals she is also a member of the Superman Squad and holder of the 7th signal watch. In fact it was her that had approached him in Nebraska to reveal his legacy and the Lightning Door, she was the hooded Superwoman! What of Lois & Clark? Even death couldn't keep them apaer, they may have had their ups and downs but after the events today, they would continue to fight for Truth, Justice and the American Way together. Their destiny? Like all the best stories, they lived Happily Ever After. Story - 3: A decent end. All the loose ends were dealt with. Superman finally got an ending to his story. All that aside it still wasn't good. I liked the concept of the crystal shards but that was about it. The whole story of Grounded was flipped into the story of Lisa Jennings becoming the third Superwoman. The explanations for Superman's depression were very hokey and we were almost hurled into a diabetic coma with all the sugar, spice and everything nice. I am sad that this was the last Superman story arc, because it really didn't tell a good solid Superman story. Superman's modern story began with Man of Steel and ended with Grounded. The beginning had such promise but his ending storyline didn't even come close to matching it. Art - 4: Jamal Igle's artwork was one of the highest points of the Supergirl book and here he pulls out all the stops. Superman on page 3 looks like he finally means business. The only thing I would have liked to have seen is more action, but aside from that Igle delivered a superbly illustrated story. Cover Art - 1: HORRIBLE. Who is that? It's not Superman that's for sure. 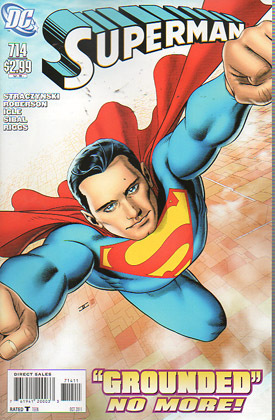 Cover Art (Variant Cover) - 4: This cover shows a brilliant Superman soaring high above Metropolis. I only wish Lois could have been with him on it.